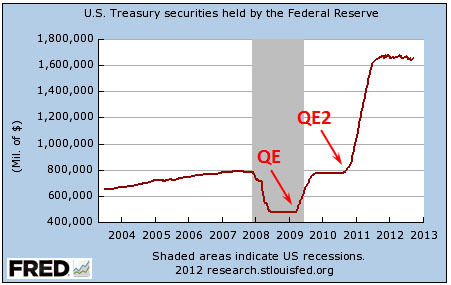 Is the Fed Really Buying Three-Quarters of All Treasury Debt? and saying, “Here, we’re giving it.” It’s just made up money, and this does not augur well for our economic future. Italics mine. So is this true? Is the Fed really buying three-quarters of all Treasury debt? Who Was at Romney’s “47 Percent” Fundraiser? Mom-and-pop investors, and not the Federal Reserve, have been the ones most responsible for driving the mad dash to government debt, according to newly released data…The demand among average investors has swelled so much, in fact, that they bought more Treasurys in the first quarter than foreigners and the Fed combined. Households picked up about $170 billion in the low-yielding government debt during the quarter, while foreigners increased their holdings by $110 billion. The Fed, meanwhile, actually slightly decreased its net holdings. So Romney is, once again, plucking a scary number he seems to have heard from a tea party symposium somewhere and mindlessly regurgitating it to a receptive audience. But he’s wrong. There was a period of about six months during 2011 when the Fed really was hoovering up a big share of all Treasury debt. But that was a one-time deal more than a year ago, and since then the big buyers of Treasury bonds have mostly been the usual suspects: foreigners and US households. Read the full transcript of Romney’s remarks at the private fundraiser. The Fed Finally Takes Action, But Is It Enough?